Mystery mask is from Gypsy Renaissance's Fabulous Faces mask collection. 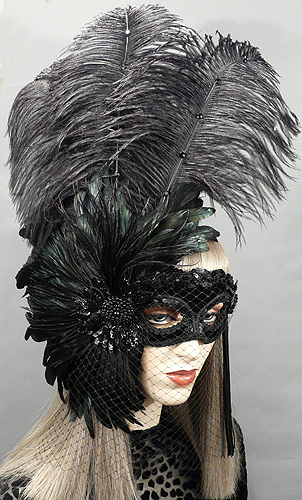 Mystery is a black mask with veil netting, ostrich plumes, and black rhinestones. Mystery mask is covered with black velvet fabric and trimmed with black braiding and sequins. Mask is adorned with a semi-circle of iridescent forest green feathers, black Russian veiling, and black ostrich plumes. Mask is embellished with black glass beaded appliqués, jet rhinestones, and chainette flapper fringe.